I am currently doing an MA in Victorian Studies and am putting together my dissertation proposal which I am intending to do on the portrayal of orphans in the works of the Brontës and how this links to their own experiences of mother-loss and isolation. I was wondering if you knew of any links that the Brontë Sisters had with regards to orphans as they grew older, i.e. any references to any of them visiting Coram's Foundling Hospital for example. Any advice or tips on where to look would be much appreciated. Buon Natale a tutti i nostri lettori in Italia! On 18th December 2009 Professor Maddalena De Leo from Ascea Marina (SA) was awarded a literary prize for an article in Italian she wrote and published in an Italian newspaper and on the Internet dealing with a comparison between an aspect of Wuthering Heights, the famous novel by Emily Brontë, and Paese di eriche e ginestre, the only novel written by the Italian critic and journalist Francesco Bruno who lived in Naples during the first part of the twentieth century. Every year a journalistic prize and a cultural evening are held to commemorate this literary man by his still living relatives. The seventh edition of the event was held this year in Naples in the elegant Red Room of Libreria Guida, a very antique and renown bookshop in the very historical centre of the city. It was a delighting evening in which three important Italian journalists gave lectures on Futurism and Francesco Bruno’s critical contribute to it at the beginning of the last century. 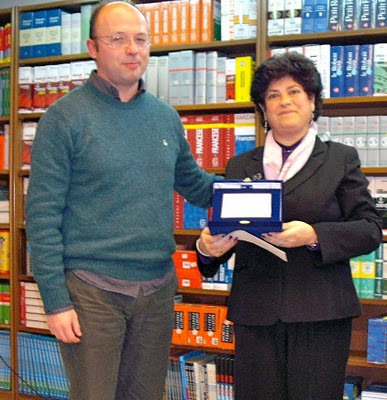 Our BS member Maddalena De Leo received a plaque and a cheque by Mr Francesco D’Episcopo, Professor of Italian Literature at University Federico II in Naples and the approval and the economical contribution of the direct heirs of the late journalist and critic, Mr Francesco Jr. and Enrico Bruno and their mother, Mrs. Maria Novi Bruno. Prof. De Leo explained to the public what inspired her to draw so strange a parallel between two worlds apparently so different, the North of England and the South of Italy, eventually the word ‘heather’ used by both the authors to describe their birth landscape. By going on in the reading of Bruno’s novel, Mrs. De Leo realized instead that the real parallel in the two novels was to be found in the inmost nature and the different fate of their main characters and so she worked on this idea. Recently I came across a rare book that is virtually unknown even to Italian readers. Written by Francesco Bruno, an eminent journalist, critic, and essayist this book was a unique and fascinating discovery. Entitled "A Country of Heather and Gorse" the work is nearly impossible to find in either bookshops or libraries. Mr. Bruno's life spanned a good deal of the twentieth century lasting from 1899-1982. Snatched by death just before completing the book it was never given a conclusion. It is my intention through this article to do just that. We would. perhaps, never even have heard of this work if it wasn't for his son Elio. A journalist and critic in his own right we owe a great deal of the preservation of this classic to him. Another tireless promoter of Mr. Bruno's work is Professor Francesco D'Episcopo. We are indebted to him for keeping the literary works of Bruno alive. The novel takes place in a rural setting, so familiar to the works of his contemporaries. It is reminiscent of Deledda and Verga where love of the land and pride in property ownership form the basis of so many of their stories. The landscape forms a backdrop against which even the birds are given human-like qualities. These fluttering birds actually seem to not only witness but in fact understand human affairs. The title of this work could easily be "A Country of Thrushes and Alder" because of its location. Set in Ascea-Velia a lovely Mediterranean region the naturaly beauty of the land is vibrantly depicted. It is in fact the birthplace of Francesco Bruno and he has very tender feelings for it. There are several references to the harsh sun of the south which causes devastating droughts. He also alludes to historical facts which occurred during the seventeenth century. There are allusions as well to social injustice and outright piracy all of which Mr. Bruno has accurately captured. His descriptions of plant life is also quite captivating. Heather, like the plant broom, both grow in cold, harsh, remote and unproductive lands. The author's protagonist, Archangel, like the plant heather can survive and even thrive in the most difficult environment. His life, like that of the heather plant endures in a sterile and barren environment. Archangel is a devout person trusting in Providence just like the characters created by Manzoni. He is an asset to his fellow countrymen lending support whenever he can. This goodness to others is not reflected in how the character views himself. Archangel is in fact dissatisfied with his sterile existence and is increasingly worried about the fact that he has no children. The psychological imagery employed by Mr. Bruno is also utilized in one of the world's most famous novels "Wuthering Heights." The "land of heather" in this case refers to the fertile and highly imaginative mind of its author Emily Brontë. In "Wuthering Heights" birds along with harsh winds and a barren landscape form a relationship to mankind's suffering. The character Heathcliff is an evil, selfish, and dominating man. He is the antithesis of Bruno's Archangel. Even though Archangel is a good man and Heathcliff an evil one they both share a similar fate. Both men are disappointed by the paths their lives have taken. Both men adopt the false belief that if they work hard and protect their land they will get whatever they want from life. Both live in homes that are isolated from the rest of the world. Bruno's "Casa Romita" perfectly corresponds to Bronte's "Heights." Bruno tells us at the end of chapter two "the story of men is changeable and cannot be contained by any rational force." Only death will draw a veil of oblivion over the inevitably stormy passions experienced in these so far off lands, one sunny and the other solitary and exposed to winds. Only by his lonely and irreligious death the diabolical Heathcliff will be able to obtain, although superficially, that peace he never enjoyed in life, and certainly for the Archangel a reverse path will be accomplished based again on a melancholy resignation and an acceptance. So in the end both Archangel and Heathcliff await death as the final and true peace. I believe this may well be the never written yet inevitable conclusion to this enigmatic novel.